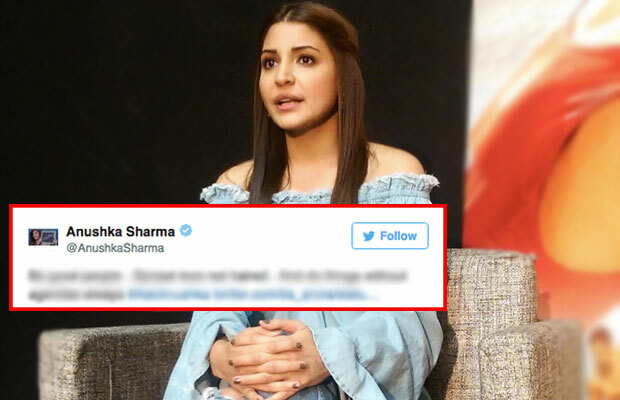 Anushka Sharma's SPECIAL Advice To Her Fans! Home BOLLYWOOD Anushka Sharma’s SPECIAL Advice To Her Fans! Bollywood actress Anushka Sharma is riding high on success with her current release Ae Dil Hai Mushkil. The beautiful actress has given many memorable performances in the recent years which include PK, NH 10, and Sultan. Anushka Sharma is the only actress to have two films in the 300-crore club- PK and Sultan. With such a good choice of films, her fan following is tremendously increasing day by day. Also, the actress will be next seen in Imtiaz Ali directorial The Ring. The actress has been showered with all praises and her performance in Ae Dil Hai Mushkil also got thumbs up from the audience as well as the critics. Anushka Sharma took out time from her busy schedule and had a #AskAnushka session on the micro-blogging site Twitter. Well, this was really a sweet reply by the actress to her fan and it truly shows the better side of her. The actress had a great time chatting with her fans and she got many praises for her performances in Sultan and Ae Dil Hai Mushkil. Thank you guys !! This was fun .Gtg now .Love you all .Thank youuuuu for all the love for #Adhm & #Sultan ???? #AskAnushka TATAAAA ?? Well, we expect that the NH 10 actress will create the same magic with Shah Rukh Khan in her upcoming film tentatively titled as The Ring which is expected to release on Independence Day 2017. Previous articleExclusive Bigg Boss 10: Salman Khan Gives Interesting Tips To This Contestant OFF CAMERA! Next articleOops! Karan Patel Locks Himself, Stalls Yeh Hai Mohabbatein Shoot!